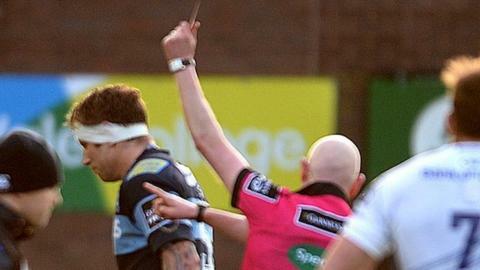 Cardiff Blues' former New Zealand lock Jarrad Hoeata has been banned for six weeks for a high tackle. Hoeata, who was sent off in his side's 22-13 Pro12 defeat by Leinster last weekend, has the right to appeal. The 32-year-old will miss their European Challenge Cup games against Rovigo and Grenoble over the next two weekends. His ban ends on 23 February and he will be available to face Edinburgh in the Pro12 on 1 March. Hoeata joined Blues from Highlanders ahead of the 2014-15 season after a career in his homeland that included three All Blacks and six New Zealand Maori appearances.